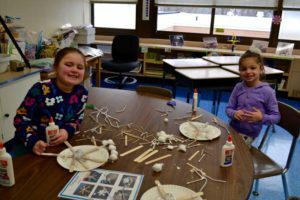 Lee Road kindergarten students Kayla Mergel (left) and Madeline Barea built their snowflakes with a variety of materials. Lee Road Elementary School kindergartners in Rochelle Cascio’s class concluded their unit on weather with a visit to the school’s science, technology, engineering, arts and mathematics room on Jan. 16. With the help of leave replacement teacher Nicole Bischof, assistant teacher Jennifer Abruzzo and special education teacher Susan Bartlein, the class created their own unique snowflakes with popsicle sticks, glue, cotton balls, pipe cleaners, string, glitter and toothpicks. Prior to the activity, the class read “Snow” by Manya Stojic, which focused on how animals respond when winter weather arrives. The students were provided with photo examples of what type of snowflakes they could create with their materials. The class enjoyed getting their hands dirty as they constructed and decorated their snowflakes. The special STEAM activity promoted both creativity and problem-solving. “I liked making and playing with the snowflakes and putting the materials on,” said kindergartner Kayla Mergel.